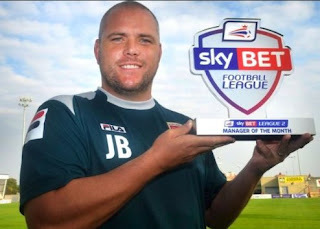 Key Personnel Liverpool born Jim Bentley has been at the helm since May 2011. 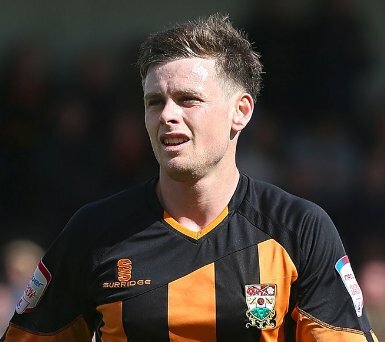 Former central defender Bentley was a youth at Manchester City and had been a player at Morecambe for a decade and before that at Telford United. Directions: A bit of a trek this one! We take the M1 onto the M6. Exit the M6 at its junction 34(A683) and head towards and into Lancaster. Stay on the one way system in Lancaster and look out for the A589 from Lancaster into Morecambe. Cross over the river and then look out for the splendid sight that is Lancaster Castle on your left on top of a hill. These guides offer so much more than dodgy directions or bogus bus routes - consider the culture and the beauty of England and indeed it’s very history, its heritage. 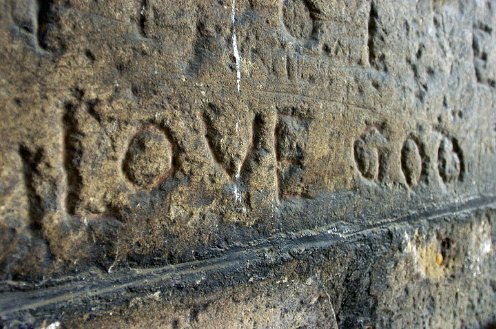 Middle Ages Graffiti on Lancaster Castle Wall - "Nicky is God"
Go straight over two large roundabouts on the second of which you will find one of those appalling drive through Chavburger joints. 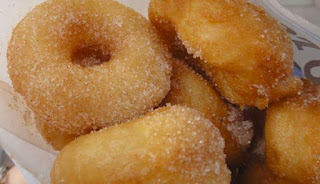 At the third roundabout, called the Shrimp Roundabout take the first exit into Westgate Road (signposted West Promenade). Go past the Fire Station on your right and after about a mile you will see the Globe Stadium also on your right. Car Parking: Parking is still at a premium at the club especially for visiting fans so your best bet is to continue past the stadium on Westgate and carry on under the railway bridge where you will find unrestricted and plentiful street parking available. By Train: The journey time is a good 4 hours with changes at Preston and Lancaster possible depending on which train you take. Morecambe station is near the seafront and approximately a 30 minute walk from the ground. From the promenade turn left and left into Regent Street (superb Indian Restaurant on the corner if you are staying over – serves Chicken Tikka with Goats Cheese, very unusual on my Tandoori Travels). Through into Westgate and you will see the ground on your left just over the railway bridge. The bus 9 or 9a from the bus stop outside Frankie and Benny's will drop you outside the stadium. A Taxi I believe is always the best option, then you can spend more time by the seaside! On away trips with my “band of brothers” sharing cabs to the ground is the norm because.......... a) it's cheap as chips when sharing b)drops you at the turnstiles c) leaves the maximum time possible in a bar and d) if you get out quick leaving the hapless one to pick up the fare he more often than not forgets to ask his pals for reimbursement! A new pub has recently opened just outside the Stadium entrance – the Hurley Flyer. Please double check but I believe the car parking is £10.00 but this can be redeemed when you purchase an amount of food from the bar. 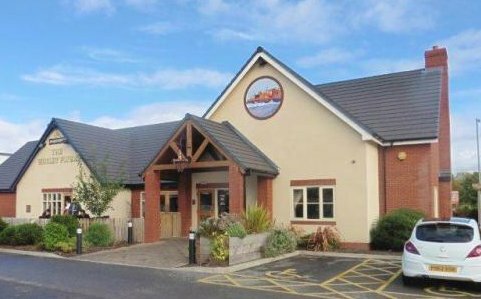 The Wetherspoon outlet is very close to the station while my favourite sea front pubs are The Kings Arms, opposite the Morecambe Statue for its range of ales, and The Pier Hotel for bar meals and beer. The journey by road to the Globe takes you through Lancaster and it is certainly a City well worth considering as a lunch stop and sampling the local ‘Hot Pot’. Morecambe as you might have already realised is a seaside town so Fish and Chips are really well represented. Atkinsons by far the best in the district can be found at 16-18 Albert Road, LA4 4HB just off the sea front. It never disappoints as in two previous visits while I was tucking into my Cod and Chips in walked a whole bunch of Bees fans - somebody reads these guides anyway! The Globe Arena has picked up a top award for it's home made pies. Morecambe FC won the Supreme Champion and the Best Football Pie award at the prestigious British Pie Awards at Melton Mowbray a couple of years back. The Chicken, Ham and Leek Pie reigns supreme but they must add a Mince and Onion Pie, Mash Potato and Parsley Sauce (Liquor) to the menu before it gets the Reckless real Seal of Approval. After 89 years at Christie Park the Club moved to a new stadium for the start of the 2010 season We shall no longer see the main stand at the old Christie Park which was built in 1962 and cost just £20,000. It occupied half of the touchline and I believe it was designed by the same architects responsible for main stand at Underhill two years later, albeit on a slightly larger scale. The similarities were evident if you looked closely. At a cost of around £12m, the Globe Arena is typical of modern football stadia The focal point is the Peter McGuigan Stand. Named after the current Chairman the stand has room for around 2,200 seats. Opposite is the North Terrace is a shallow open terraced area, no doubt to be developed in time. It resembles the old Car Wash terrace at Christie Park – perhaps the club wanted fans to feel at home? Both ends have covered terraces. 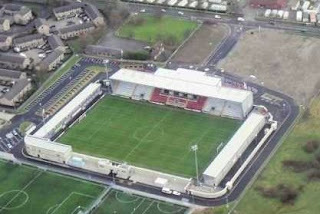 The larger West Terrace for home supporters and the smaller Bay Radio East Terrace, with room for around 1,400 for visitors. Seating is available for visiting supporters too. Southport, Barrow and in years gone by Lancaster City. After a Mark Byrne screamer in 2011 it dawned on me rather quickly I am “past it” after tumbling down the steep steps to try and get to the celebrating Barnet players – I use to manage a Terrace Run with ease but alas no longer! We were Morecambe s first ever Football League opponents in August 2007 - the teams celebrated with a 0-0 draw. Over 2,000 witnessed a Conference play-off position clash in February 2004 which saw Barnet take a three goal half time lead through a side foot finish from Joey Gamble, a Ben Strevens curler and a poached goal that Giuliano Grazioli would be proud of from a goal machine called Simon Clist. Morecambe pulled one back in the second half but the result was never in doubt. The one sided 5-1 victory in September 2004 at Underhill was also extra special – it featured a brace from Grazioli, an Ian Hendon penalty, plus goals from Simon King and Nicky Bailey. 8/10, as everybody loves the seaside don’t they? The York Hotel has been offering inexpensive, basic yet comfortable bed and breakfast accommodation to away supporters for years – no doubt it will be full. Mrs Reckless and I stayed at a very pleasant B&B called the Ashley last time and I have no problems recommending it for the stay. Morecambe Bay is reputedly one of the best for wildlife in Europe however the bay tide is one of the most dangerous as the tragic drowning of 19 Chinese refugee cockle pickers in February 2004 illustrates. On a happier note - If pubs, night-clubs, Whipple Ice Cream 99’s, Candy Floss and Hot Doughnuts (the delicious made right in front of you type which travel down a conveyor belt of hot oil and then tumble into a pile of sugar) is what you seek then Morecambe is for you! If you have never walked on snow on top of sand it is weird. 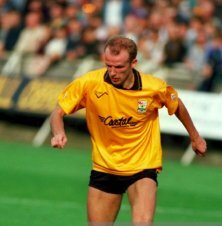 Ex Bees legend and ex Shrimp Kenny Lowe holidayed for a week every year at Morecambe without fail, he once told me so - he’s from the seaside and he plays out wide. Comedienne Victoria Wood was born in Morecambe as was Eric Bartholomew who with his partner Ernie Wiseman became possibly Britain’s best loved comedy duo. (He must have been an avid fan of The Shrimps as he was a Director of Luton Town FC). 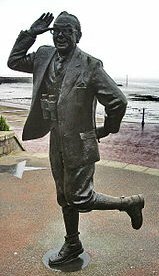 Guarantee that someone will drape a Bees scarf around the bronze statue of Eric on the Promenade for a photo opportunity – I know I have!